Case skid steer loaders deliver industry-leading bucket-breakout force and hinge-pin height — plus best-in-class horsepower, model by model, boosting your productivity. 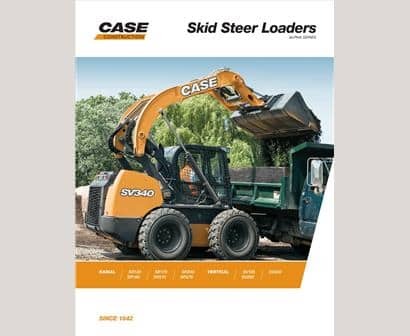 CASE skid steer loaders are designed to dominate. Whether you’re up against tough digging, loading, pushing, or grading, these skid steers deliver overall best-in-class performance and breakout force. After all, you deserve a machine that works as hard as you do. With more than more than 9,500 lbs (42.3 kN) of breakout force, CASE skid steer loaders provide you with more strength to lift and move, so you can do more each day. CASE skid steer loaders offer three different optional auxiliary hydraulic packages: standard, high-flow and enhanced high-flow. They also offer secondary auxiliary hydraulics for applications requiring multiple hydraulic movements simultaneously. A wheelbase that’s up to 21% longer gives you stability you can feel. The improved weight distribution enables you to lift larger loads and reduces control jerking, back jolting and load-spilling bounce when hauling. Clear curbs easier, retain more material and experience a faster, more comfortable ride. Easily see what’s all around you with industry leading visibility and standard side lighting, ensuring skid steer operators can maneuver quicker and more confidently at any time – that’s safe operation. Every CASE skid steer loader features a proven Tier 4 Final solution that is tailored for that model. CASE Tier 4-certified equipment is easier to maintain and, unlike competitive models, won't require you to master additional maintenance procedures. In fact, most CASE machines have maintenance-free emission solutions, so you can stay focused on your work—and not maintaining your machine. Ask your technicians. Case has a reputation for easy-to maintain-and-service equipment. The new Case skid steers are no exception. The new design dominates the industry’s top SAE serviceability rankings with features such as easy ground-line access for daily maintenance checks. ​Configure and price your new skid steer loader​​.